Hana mourns the death of the Queen, 1917. HANA, Maui, Nov. 23.—In all the islands there is no place more intensely loyal to the noble traditions of the Hawaiian race than in Hana. A queen of Kamehameha I was born at Hana. Queen Kaahumanu was born in a cave on Kauiki Head. Royalty often visited at the home of her parents. At Wananalua church on Sunday morning a large and representative audience gathered to pay the last honors to the late Queen Liliuokalani. The ancient Hawaiian building was very attractively decorated with flags, royal palms and many beautiful flowers. William Lennox of the Hana store very kindly loaned his valuable and beautiful collection of royal Hawaiian and other flags. “Old Glory” was there floating over all. The music and all parts of the service were especially appropriate. The sermon of the morning in English and Hawaiian was upon the text Acts 16:14, Lydia the God Queen. Representative citizens of the Hana district spoke. William P. Haia, Mr. George P. Kauimakaole, Rev. Mr. Mitchell and P. Kamohe called to mind the many virtues of the queen. Mr. Kemohe is the oldest Hawaiian in all this section. Hana “did itself proud.” The occasion was a notable one and the Wananalua church arose to the opportunity. The day and the celebration will not be forgotten in many years. Honolulu Star-Bulletin, Volume XXV, Number 7993, Page 37. November 24, 1917. Wailuku memorial for Queen Liliuokalani, 1917. 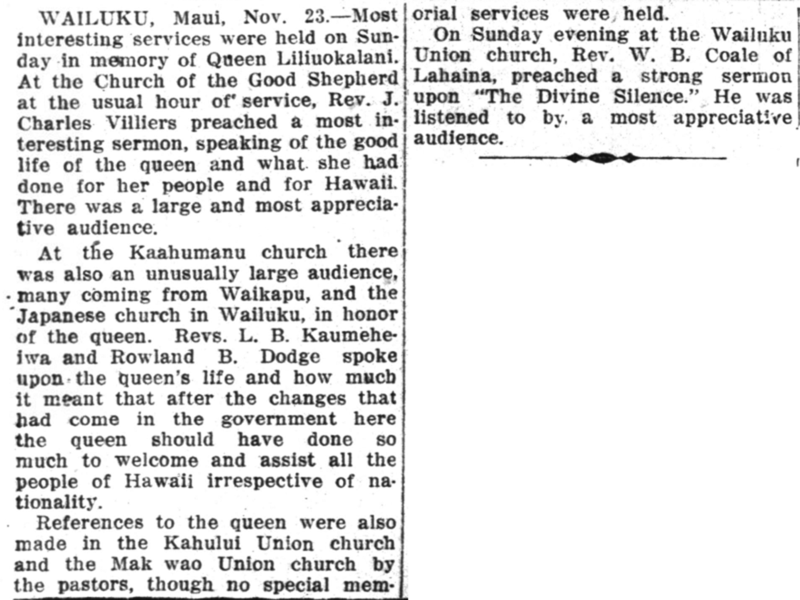 WAILUKU, Maui, Nov. 23.—Most interesting services were held on Sunday in memory of Queen Liliuokalani. At the Church of the Good Shepherd at the usual hour of service, Rev. J. Charles Villiers preached a most interesting sermon, speaking of the good life of the queen and what she had done for her people and for Hawaii. There was a large and most appreciative audience. At the Kaahumanu church there was also an unusually large audience, many coming from Waikapu, and the Japanese church in Wailuku, in honor of the queen. Revs. L. B. Kaumeheiwa and Rowland B. Dodge spoke upon the queen’s life and how much it meant that after the changes that had come in the government here the queen should have done so much to welcome and assist all the people of Hawaii irrespective of nationality. References to the queen were also made in the Kahului Union chuch and the Makawao Union church by the pastors, though no special memorial services were held. On Sunday evening at the Wailuku Union church, Rev. W. B. Coale of Lahaina, preached a strong sermon upon “The Divine Silence.” He was listened to by a most appreciative audience. 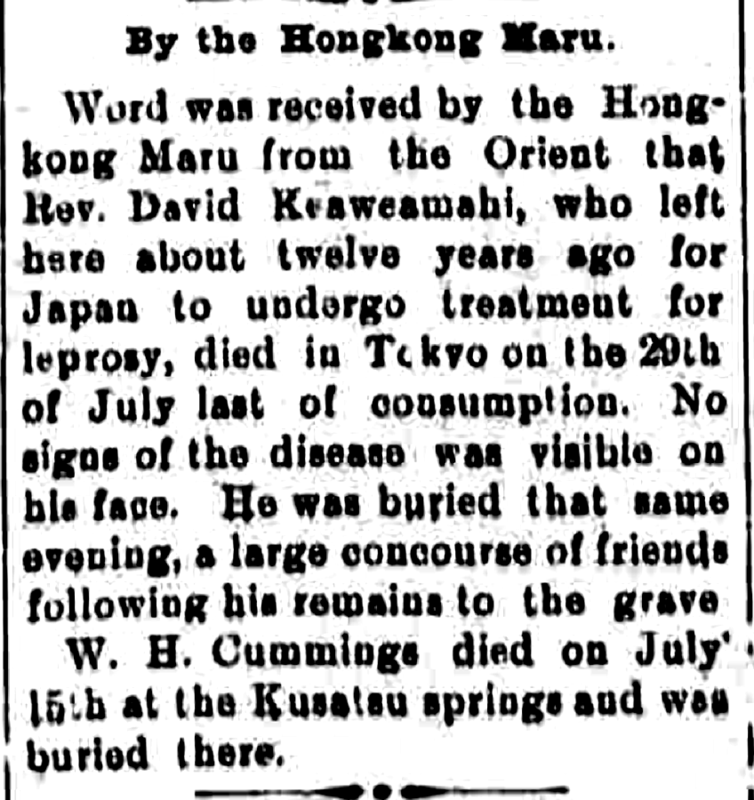 Report of deaths in Japan, 1900. W. H. Cummings died on July 15th at the Kusatsu springs and was buried there. The Independent, Volume XI, Number 1584, Page 3. August 14, 1900. On the Wailuku Union Church, 1912. Brief History of the Wailuku Church. The first building of the Wailuku Union Church was erected in the early part of 1867. Mr. Christopher H. Lewers, Mr. Edward H. Bailey and several others then living in Wailuku were interested in its erection, and assisted in the work. “The Friend” of a somewhat earlier date speaks of the work of the ladies of Wailuku in raising nearly $400 toward the new building. Rev. Thomas Gardner Thurston, second son of Asa and Lucy G. Thurston, of Kailua, Hawaii, was the first pastor of this Church. He was ordained in the Kaahumanu Church, and ministered to both English-speaking and Hawaiian congregations, beginning his work in the month of October, 1866. PERTAINING TO THE CHURCH IN WAILUKU. Wailuku, Maui, July 27, 1835. O Tinker—Rejoice with us, at your former place, because our church is complete. It is an adobe structure—but it is good nonetheless. The length is fifteen fathoms in length. Seven fathoms in width. There are five entrances, and they are complete with doors and hinges. There are fifteen windows with shutters. The inside of the building is plastered. After it was complete, we consecrated the building to Jehovah, the Father, the Son, and the Holy Spirit. On that day, the house was filled—everyone could not fit inside. This is how we went about it. 1. We beseeched for assistance in the work that day of Jehovah, the Father, the Son, and the Holy Spirit. 2. We read the words of God. II. Chronicles, chapter 6. 3. We sang, hymn 33. 5. We once again sang, hymn 52. 1. God’s dwelling with man is amazing. Because—He is a great God.—He is glorious—powerful—holy—he is good. His soul is immaculate—his thoughts are righteous—his deeds are correct. He is a jealous God, and he is loathe of vice. And man is small—and weak—he is not good—his soul is unclean. He is rebellious. He is an enemy of God. How can God dwell with men on earth? II. It is highly desired for God to dwell with man. William H. Bailey donates grand clock to Kaahumanu Church, 1884. On the 7th inst, Mr. W. H. Bailey formally presented to Kaahumanu Church of Wailuku, a valuable Seth Thomas Tower Clock for the tower that has lately been erected on that building. It is of the Hotchkiss patent, strikes the hours and runs eight days. The dial is six feet in diameter and can be seen from a long distance. While Rev. 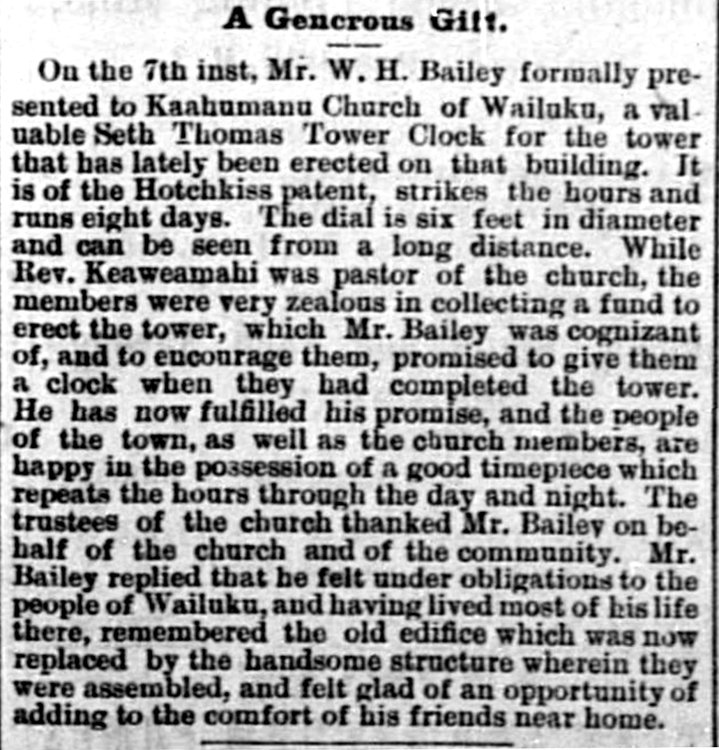 Keaweamahi was pastor of the church, the members were very zealous in collecting a fund to erect the tower, which Mr. Bailey was cognizant of, and to encourage them, promised to give them a clock when they had completed the tower. He has now fulfilled his promise, and the people of the town, as well as the church members, are happy in the possession of a good timepiece which repeats the hours through the day and night. The trustees of the church thanked Mr. Bailey on behalf of the church and of the community. Mr. Bailey replied that he felt under obligations to the people of Wailuku, and having lived most of his life there, remembered the old edifice which was now replaced by the handsome structure wherein they were assembled, and felt glad of an opportunity of adding to the comfort of his friends near home. Hawaiian Gazette, Volume XIX, Number 37, page 8. September 10, 1884. Hawaiian medical kahuna and haole doctors, 1871. Answer to W. P. Waha. Perhaps it is well that I explain in your newspaper a thought responding to W. P. Waha of Honomaele Uka, Hana, Maui. In the newspaper, Kuokoa, Buke 10, Helu 27, of the 8th of this past July, Waha published an opinion pertaining to the Practice of Hawaiian Medicine. From what I saw searching from beginning to end; this is what I mainly got out of it, that “he is jealous, malicious, and a slanderer, ” and so forth. You just chomp your mouth like a wild shark of the sea saying, “All of the Hawaiians are dying because of whom? Yes! They are dying because of you Heads of the Government!” If that is the intent of the questioner, then I ask of you, “Is that indeed true?” Let us all look at the thoughts of this malicious inciter, being that the Heads of our Nation are not looking to kill off the Hawaiian Lahui, and ways to kill them, but it is you, and it is you yourselves who offer yourselves off to die; and you enjoy grumbling to our Heads of Government. Take a short look at this, you fault finder; During the past session of the Legislature, in the year 1870, $4,000 was put to teach Hawaiian youths Medicine, and in the month of November of last year, the government chose the proper person in which they trust, as a teacher for the school, and it is being taught now. There is no other reason for this action except because of the aloha for you, O Hawaiian people.